By Mark - Nicaragua - 15 Feb/03 - Viewed 1883 times. We took the 4.45am bus to Liberia, then a very bumpy bus to the Nicaraguan border. On the bus was a French guy who lives in Costa Rica but has to leave every three months to get a new tourist visa. He wanted us to share a taxi with him and two other tourists to Rivas - he said it was only a bit more expensive than the bus but more comfortable. We agreed, and when we got to the border he started ordering everyone around as if he was our tour guide and we had never crossed a border before. Once we had finally got to Nicaragua and paid all the taxes (N$7.68 exit tax, N$102.69 entry tax, N$14.67 city tax) he found a taxi. It was just a normal car for the five of us plus driver and he expected me and Laura to share the front seat. The bus was parked next to it and looked okay (for an old US school bus anyway) so we got that instead. We had a seat to ourselves and it cost half the price (N$10.00). When we got to Rivas we only had 10 minutes until the next boat so we got a taxi the short distance to the port. We got there just as it was leaving, and an hour later finally arrived on Isla Ometepe. 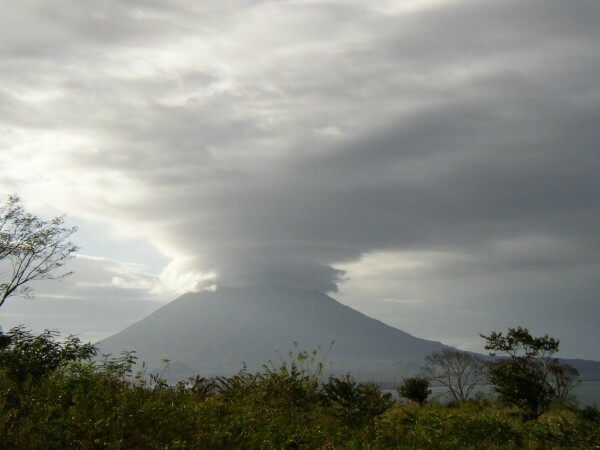 Isla Ometepe is an island formed by two large volcanoes in the middle of Lago Nicaragua. The lake is unique because there are many species of fish that have swum up the river from the sea and evolved to breathe fresh water instead of salt water, including the only fresh water shark in the world. There are only two small towns and a few villages on the island and it is very laid back and friendly. We spent the night in Moyogalpa at Hotelito Ali. Everything seemed very cheap after Costa Rica and we had a huge fish dinner in a nearby restaurant. The next morning we left the hotel in plenty of time to catch the 10am bus to Balg�es. We asked three locals where it left from and two of them agreed - so we went there. Unfortunately, the third guy was correct so we had to run down the road when we saw it in the distance. According to the guidebook the journey takes an hour, but it actually took two and a half. Once in Balg�es we walked the two kilometers to Finca Magdalena, a converted farmhouse on the slopes of one of the volcanos. They still farm bananas and coffee there and you can wander through the plantations and see petroglyphs. The guidebook also said they only had dorms so we were pleased to find a double room for N$66.02. The only place to eat is at the farm. The meals are quite good although all based around rice, eggs and fried bananas. We took a Spanish speaking guide to see the petroglyphs (N$58.68), he was quite interesting, and carried a two foot long machete (not sure why). The petroglyphs are thousands of years old and carved on boulders strewn around the farm. They depict serpents, butterflys and other animals. We met a German couple who were travelling around Central America in their own light aircraft! In the evening everyone eats together at the farm and there is quite a good atmosphere. At six the next morning we got up, had breakfast and set off up Volcan Maderas at 7am. We had organised a guide at the farm for N$220.05 because the guidebook (by now we should know not to trust it!) said that you couldn't find the way without one, and you needed a rope for the last part which the guide would provide. In reality though it is easy to find the way and there is a rope always fixed on the necessary bit. After 2km we were in the clouds and it started getting very muddy. Soon we were covered in mud. Once we reached the top after about three hours we decended into the crater. The last bit requires a climb down a cliff with the help of the rope. Eventually we reached the crater lake which was the object of our trek. Unfortunately the clouds meant we could only see about 2m in front of us. It was too wet to sit down so we started back down straight away. We expected it to be quicker down but it actually took longer because it was so slippery by now. We gave up trying to stay dry and clean and resigned ourselves to being covered in mud from head to foot. Our guide managed to keep himself immaculate. We got back just short of eight hours after starting. We had some quick food and tried (unsuccessfully) to clean the mud out of clothes. Then we walked back to the bus stop to catch the 4.30pm bus back to Moyogalpa. After half an hour we started asking locals about the bus. One said it had left at four, one that it would be along in a minute and one that it always left at six. We didn't have much faith in any of this information, so we took the crazy decision to walk to Playa Santo Domingo rather than back to the farm (we would see the bus and flag it down if it really left at six). So we walked another 5km with our big backpacks. No vehicles passed us in two hours except locals on bicycles. Everyone was really friendly and said hello. We finally arrived at one of the two hotels in Playa Santa Domingo just before 7pm and got a room for N$146.70. We showered (covering the bathroom in mud) and went to have dinner. The restaurant in the hotel is very nice, a little expensive and right on the beach. We felt we deserved a night out after all the walking so we had a nice meal and some drinks. We didn't even realise until the next day that it was Valentines Day. We allowed ourselves a lie-in instead of getting the 5am bus. We were glad we had got to see the tranquil Playa Santa Domingo and sat on the beach until the 1pm bus. It was a bit late so we were beginning to wonder if we had the wrong information again but it finally turned up and we got to Moyogalpa at 3.30pm. We managed to get lost because the landmark we had used were some road works and they had moved them to the next street! I had another go at getting the mud out of clothes (still unsuccessful) and then we had a much needed early night. Another early morning - 5.45am to catch the 6.45am ferry. From the port we shared a taxi to Rivas and then a bus to the capital Managua which took two and a half hours. By the time we got there we couldn't face the six bus journey on local buses to Utila in Honduras so we got a taxi to the Ticabus station and booked on the international bus for the next morning. There is now a service all the way to San Pedro Sula for N$410.76. We checked into a nearby hotel and looked round Managua. We went to the cathedral that was damaged in an earthquake but gravity has finally caught up with it and you can no longer go inside. Managua was very hot, not much was open because it was Sunday and everyone we met was really miserable. We found a US style mall and it was lovely and cool inside and full of smiling, happy people so we stayed there the rest of the day. The mornings just get earlier - 3.30am as we had been told to be at the bus station 4am. The bus doesn't actually leave until 5am and it would have been okay to turn up with only 15 minutes to spare. It was nice to be on a real coach instead of a US school bus - there were head rests, it wasn't three to a seat and no-one was trying to preach or sell us anything - we had almost forgotten what it was like. Near the Honduran border the conductor took all our passports and filled in the immigration forms for us. He didn't know a lot of the details, such as our occupations, destination etc so he just made them up.